IBM® Rational® Rhapsody® Architect for Systems Engineers can help your team design complex functionality in less time. It provides a low-cost system engineering environment that lets you analyze and elaborate requirements, make architecture trade-offs with parametric evaluations, and document designs. The software automatically creates systems specifications, interface design documents and systems test cases using SysML, UML, AUTOSAR or UPDM. IBM Rational Rhapsody Architect for Software lets you rapidly move from design to implementation. It offers a low-cost integrated software engineering environment to graphically architect C++, C or Java applications using UML or AUTOSAR. Reuse existing code with reverse engineering or generate code frames (including MISRA-C and MISRA-C++). 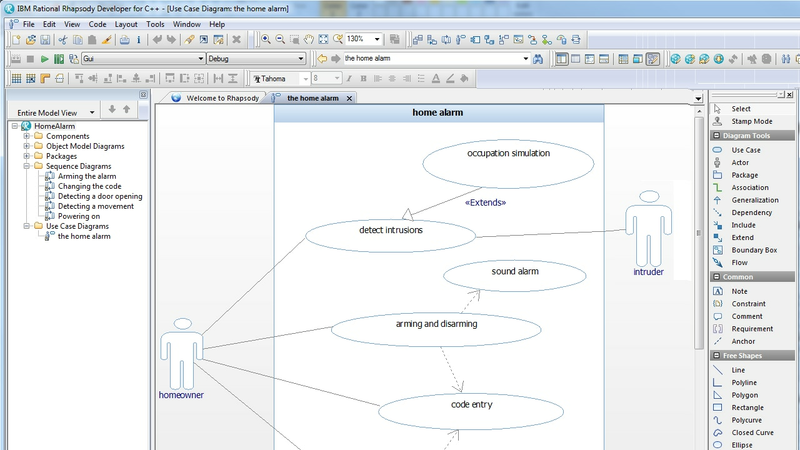 Automatically synchronize design and code, generate design documentation and graphically specify test cases. IBM Rational Rhapsody Design Manager helps cross-discipline teams collaborate, share, review and manage designs and models using a central repository with web-based access. Suppliers and customers can access information through a web client. The software automates design reviews with stakeholders to facilitate the communication of requirements, speed decision-making and improve quality. You can create comprehensive documentation for specifications, communication, compliance and reporting. IBM Rational Rhapsody Designer for Systems Engineers includes all the capabilities of Rhapsody Architect for Systems Engineers plus allows you to prototype, simulate and execute designs for early validation of requirements, architecture and behavior. It is a model-based systems engineering (MBSE) environment using the industry-standard SysML and UML. It helps you adapt to changing customer requirements, improves productivity and reduces time-to-market with advanced validation and simulation. IBM Rational Rhapsody Developer offers an embedded and real-time agile software engineering environment with full application generation for C++, C, Java and Ada (including MISRA-C and MISRA-C++). It also provides rapid prototyping and simulation for design-level debugging, automated build generation for continuous integration and support for safety-critical software lifecycle—in addition to the capabilities of Rational Rhapsody Architect for Software.